We can talk about Barbra Streisand's voice all day until the end of eternity -- but seriously, have you seen her nails? The singer's nails have been a part of her look since the beginning of her career, following the star around the world, on stage and in the recording studio for as long as we can remember. Except when she was filmingYentl in 1983, nails and Streisand have gone hand-in-hand -- literally. The post, shared on Sunday, is putting an "age-old" rumor to rest -- her nails are real and always have been. "Even when I had to learn the guitar for A Star Is Born, I only had to cut them on one hand," she explained in between pictures of her on the harp, with a microphone and on the red carpet. Note taken, Babs! January 1960 -- In this iconic photo, Barbra poses for a photo call for "Funny Girl" which she starred in for a year. She was nominated for a Tony for "Best Leading Actress in a Musical." January 1965 - Streisand is photographed wearing a fuchsia pink silk dress with a scoop neckline and a matching bow around the waist. March 1966 - Streisand is photographed in Central Park. June 1966 - Streisand with her former husband, Elliott Gould at the opening of an exhibition at the Grosvenor Gallery. June 1967 - Streisand attends a pro-Israel rally at the Hollywood Bowl, Los Angeles, to raise emergency funds for Israel after the Six-Day War. January 1969 - American actor John Wayne (1907 - 1979) holding an Oscar that he was awarded for his role in True Grit with Streisand. February 1969 - Streisand holds her Golden Globe award for Best Performance by an Actress in a Motion Picture - Comedy or Musical at the 26th Annual Golden Globe Awards. April 1972 - Streisand performing on stage. October 1973 - Streisand, wearing a turban and a fur jacket, surrounded by men in tuxedos at the premiere of director Sydney Pollack's film, 'The Way We Were', in which she starred. December 1976 - Streisand, Jon Peters, and Guest during 'A Star Is Born' New York City Premiere - After Party at Tavern on the Green in New York City. January 1977 - Streisand wins three awards the 34th Annual Golden Globe Awards at the Beverly Hilton Hotel. December 1982 - Jon Peters and Barbra Streisand during 'Six Weeks' New York Premiere Party at New York Hilton Hotel in New York City. January 1984 - Barbra Streisand attends the 41st Annual Golden Globe Awards and wins two more Golden Globes. March 1986 - Streisand attends the 38th Annual Director Guild of America Awards Honors Akira Kurosawa. August 1990 - Actor Nick Nolte and actress/singer Barbra Streisand on August 21, 1990 on the set of the film 'The Prince of Tides' in New York City. December 1991 - Streisand attends 'The Prince of Tides' Century City Premiere. September 1992 - Streisand attends the 1992 U.S. Open Tennis: Men's Singles Third Round Andre Agassi vs. Jan Siemerink. September 1995 - Streisand attends the 47th Annual Primetime Emmy Awards where she was awarded Outstanding Individual Performance in a Variety or Music Program - Barbra Streisand: The Concert. August 1998 - Barbra Streisand during James Brolin Honored with a Star on the Hollywood Walk of Fame at Hollywood Boulevard. January 2000 - Streisand attends the 57th Annual Golden Globe Awards where she was awarded the Golden Globe Cecil B. DeMille Award for Lifetime Achievement. November 2001 - Streisand sings 'You'll Never Walk Along' closing the 53rd Emmy Awards show. After two postponements attributed to the war on terrorism, the awards show is finally being held at a small venue, the Shubert Theatre. March 2002 - Robert Redford and Barbra Streisand during The 74th Annual Academy Awards - Press Room. September 2002 - Streisand performs at National Democratic Gala, a benefit to help win a democratic majority in the U.S. House of Representatives. January 2004 - James Brolin and Barbra Streisand during The 61st Annual Golden Globe Awards. December 2004 - Streisand during 'Meet the Fockers' Los Angeles Premiere. October 2005 - Streisand performs at the Andre Agassi Charitable Foundation 10th Annual "Grand Slam for Children" fundraiser. May 2008 - Streisand attends the 2008 ASCAP Film and Television Music Awards at the Beverly Hilton Hotel. December 2008 - Streisand attends the 31st Annual Kennedy Center Honors at the Hall of States in the John F. Kennedy Center where she was a recipient of the honor. May 2010 - Streisand and James Brolin spotted in Malibu, California. February 2011 - National Academy of Recording Arts and Sciences president Neil Portnow and Barbra Streisand pose backstage at 2011 MusiCares Person of the Year Tribute to Barbra Streisand. February 2011 - Streisand attends The 53rd Annual GRAMMY Awards held at Staples Center. November 2011 - Donna Karan and Barbra Streisand arrive to the 10th Annual Celebration Of Dreams at Bacara Resort and Spa. 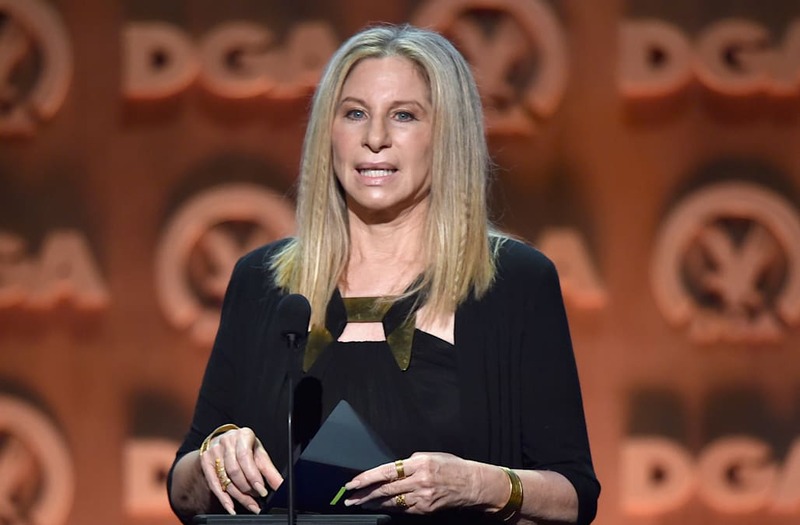 October 2012 - Streisand performs at Barclays Center in Brooklyn.